Life Insurance Corporation of India (LIC) offers Term Assurance Riders for life cover in case of inappropriate demise of the policyholder during the cover period. LIC New Term Assurance Rider plan can be attached to a basic policy to provide add-on benefit at a nominal cost. It should be attached only to the Non-Linked plans at the inception of the base policy. These Term Assurance Riders can be added to savings plans, and the insured can enjoy the benefits of both protection and savings. The unique identification number (UIN) for this scheme is 512B210V01. This UIN should be used in all relevant documents provided to the policyholders. Life Assurance is a form of insurance providing for the payment of a specified sum to a named beneficiary on the death of the life assured. If the policyholder dies during the policy term, then the Term Assurance Rider Sum is paid. In case the insured survives till the end of the term, then no amount will be given to their nominees or assignees. What are the Features of Term Assurance Rider Plan? 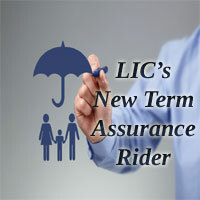 The main features of the LIC New Term Assurance Rider Plan are mentioned below. A pure term rider with only Death benefits, i.e., it offers financial protection against death throughout the term. Assurance Rider Plans can also be chosen along with a plan and cannot be taken standalone. Death Benefit: In the case of unfortunate death of the insured during the term of the Rider, an amount equal to the Term Assurance Rider Sum Assured shall be payable to the family members. Maturity Benefit: Nothing is payable if the policyholder survives till the end of the term of the rider. Tax Benefit: The amount of Tax paid shall not be considered for the calculation of benefits payable under the LIC New Term Assurance Rider. Cooling-off period: If the Policyholder was not satisfied with the Terms and Conditions he/she might return the policy to the corporation within 15 days. The count should be from the date of receipt of the plan. Term Rider Benefit is available only under the policies where the term rider option has been implemented by the insured and accepted by LIC. The extra premium meant for term assurance rider must have been received by the LIC, and the benefits may vary with the type of plan. Mode rebates will be same as that of the basic plan. High Sum Assured Rebate will be Nil. LIC New Rider Plan Premium Calculator is used to calculate the premium amount in monthly, quarterly, half-yearly and yearly modes. Through LIC’s New Term Assurance Rider Plan Calculator, you can calculate the Raider Premium amount that has to be paid to get all the benefits available under this policy. The data required for calculating premium rates using LIC New Term Rider Premium Calculator are Name, Email-Id, Age, Term, Sum Assured, etc. The buying process for LIC New Term Assurance Rider Plan will be same as the base policy that means the plan the Policyholder opts. The documents required for this rider plan will be same as that of Base Plan. The insurer who wants to buy a new term assurance rider plan should follow the rules and guidelines that are mentioned in the base plan. The buying procedure varies as per the base plan, so you have to keep the documents such as Proposal form, Address proof, Annual Income Details, Bank Account number, etc. with you before buying the term assurance rider. The Claimant should submit the following general documents while lodging the claim in case of death of the Life Assured. The required documents will be same as that of the base plan chosen by the insured. Paid-up Value: No paid-up values are available under this LIC New Term Assurance Rider plan. Surrender Value: No Surrender value was acquired for this rider. However on surrender of the underlying policy to which this rider is attached, additional rider premium shall be refunded which was charged in respect of cover after PPT. Single Premium policies: The refundable amount shall be 90% of the single premium for the Rider multiplied by the ratio of an outstanding term to original term of the rider. Limited Premium policies: The refundable amount shall be 75% of a value calculated based on duration elapsed in completed years as on date of surrender as well as on the Sum Assured, Premium Paying Term, and Term of the Rider. Regular premium policies: Nothing will be refundable. Policy Revival: The Policy will lapse if the premium was not paid within the grace period. The Lapsed policy along with the basic policy may be revived within a period of two years. The rider can only be renewed along with the basic policy and not in isolation but before the cover ceasing age. The rate of interest will be as fixed by the Corporation and may vary from time to time. Suicide Clause: LIC New Term Assurance Rider Plan being a rider there are no specific exclusions. Suicide claim provision would apply as mentioned in the Basic Policy about the rider. A. Life Assurance is a form of insurance providing for the payment of a specified sum to the nominee/ assignee on the death of the life assured. 2. Can I get any Maturity Benefits in the LIC New Term Assurance Rider Plan? A. No there are no maturity benefits available in this New Term Assurance Rider. 3. Who will get the benefits of Term Rider? A. Term Rider Benefit is available only under the policies where the term rider option has been exercised by the policyholder and accepted by LIC.